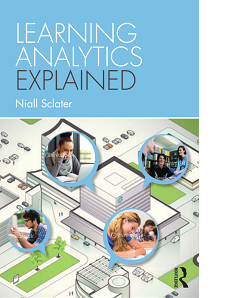 Niall’s book Learning Analytics Explained will be available early 2017, and can be pre-ordered from Amazon. For citations see Google Scholar. Sclater, N., Peasgood, A., Mullen, J. (2016) ‘Learning Analytics in Higher Education: A review of UK and international practice‘, Jisc, London. Sclater, N., Bailey, P. (2015) ‘Code of Practice for Learning Analytics’, Jisc, London. Sclater, N. (2014) ‘Code of practice for learning analytics: a literature review of the ethical and legal issues’ Jisc, London. Sclater, N. (2014) ‘Learning analytics: the current state of play in UK higher and further education’ Jisc, London. Sclater, N. (2010) ‘Open Educational Resources: Motivations, Logistics and Sustainability‘ in Ferrer, N. F. & Alonso, J. M. (eds) Content Management for E-Learning, Springer. Sclater, N. (2009) ‘The Organisational Impact of Open Educational Resources‘ in Ehlers, U. & Schneckenberg, D. (eds) Changing Cultures in Higher Education: Moving Ahead to Future Learning, Springer. The original publication is available at www.springerlink.com. Kerawalla, L., Minocha, S., Conole, G., Kirkup, G., Schencks, M., Sclater, N. (2007) ‘Exploring students’ understanding of how blogs and blogging can support distance learning in higher education’. In Wheeler, S. and Whitton, N. (Eds). Beyond Control: learning technology for the social network generation. Research Proceedings of the 14th Association for Learning Technology Conference (ALT-C 2007) 4-6 Sept 2007, Nottingham University, England.